So, how is your Ancient Greek? If you can recognize shapes, then you can help researchers transcribe 500,000 papyri fragments as part of the Ancient Lives Project. In 1897, two British researchers began excavating the remnants of a Greco-Roman city in Egypt known as Oxrhynchus or ‘City of the Sharp-Nosed Fish’. 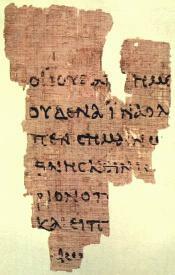 What resulted from the dig was a treasury of texts which have yet to be completely translated. To expedite the process, the papyri have been scanned and are presented on-line so that the greater internet world can help transcribe the pieces. Through an easy user interface, you are presented a fragment and need to identify letters with the help of an ancient alphabet at the bottom of the screen. The Ancient Lives project is sponsored by several organizations: Oxford Papyrologists and Researchers, The Imaging Papyri Project, The Oxyrhynchus Papyri Project, the Egypt Exploration Society, Citizen Science Alliance, the University of Oxford and the Arts & Humanities Research Council. I’ve done about a dozen fragments myself which was pretty cool. How often does 5-10minutes of down time turn into an archaeological project? Enjoy!